Certified mental health therapist Olivia Hudson has spiraled into a dark depression her own training can't pull her out of. Since Olivia can’t return to her practice when she can’t even help herself, she moves to Stone Harbor, Maine, to heal and help her dementia-ridden grandmother run her once-famous bakery. Blake Hartford is living his dream of farming blueberries and restoring a Victorian farmhouse on his coastal property, while his beloved community withers away under a rocky economy. Blake joins the town board to help revamp things and boost the much-needed tourism that can turn his community around. After a misunderstanding with the bakery owner's granddaughter and the town board's suggestion they lead the tourism project together, life in Stone Harbor gets a little bit sweeter. But when the truth of Olivia's past comes to light, Blake is forced to confront his own. 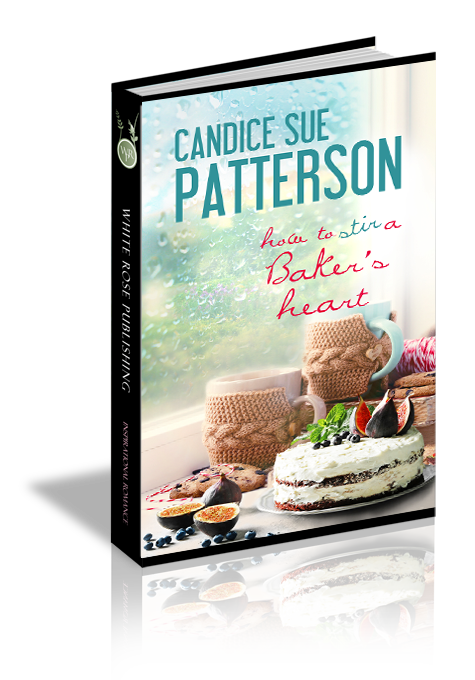 How to Stir a Baker’s Heart is a story of healing and forgiveness, proving God can mend our brokenness and soften even the hardest of hearts. For Olivia Hudson, starting over was like trying to bake an award-winning pie out of olives and sauerkraut. No matter what ingredients she added to balance the flavors or how she arranged them, it wouldn’t work. Life was not a beach or a box of chocolates. Though chocolate did help. The delectable, fudgy scent of her triple layer chocolate cake stirred Olivia’s senses as she stretched across the bakery counter and placed a fresh slice in front of her favorite customer. In the four months Olivia had lived in Stone Harbor, Maine, she’d formed an attachment to Arianne Anderson. The sugar-craving bridal boutique owner had an honest, down-to-earth personality Olivia found refreshing. “Thanks.” Arianne lifted her fork as though it weighed a hundred pounds. “Vanilla latte?” Olivia picked up a disposable cup and started the process, already knowing Arianne’s answer. Arianne stared at the thick brown frosting in a daze, sighed, and swallowed her first bite. Her eyelids fluttered closed, and her shoulders relaxed. Olivia chuckled. All would be well in Arianne’s world now—at least until the plate was empty. More tears. Now that Arianne’s faucet was running, there was no turning it off. Olivia joined Arianne on the customer side of the counter and took the next wooden stool beside her. She pressed her fingertips to her lower back. Through the wall of paned windows, an orange sunset lowered against the icy harbor, giving an ethereal look to the lobster boats and dories coated with frost. Perfect for wall art. This sweet woman wanted a baby more than anything. Meanwhile, other women conceived unwanted children all the time. The world wasn’t right. Arianne snatched up the napkin, made a face at the black stains, and smiled at Olivia’s offer of a fresh one. The pungent smell filled the room as strongly as the words hit her heart. It was true in Arianne’s case. It didn’t apply to Olivia’s situation. That’s why work was such a great distraction. Her legs and feet ached, and her back complained by closing time every day, but the twelve-hour schedule did her good. She couldn’t dwell on regrets when she was too exhausted to think. Sleep, of late, had been blessedly quick and deep. Don’t believe the lies. How many times back home had Olivia said that to patients in her office? Easy for her to say, but harder to believe now that she’d experienced the dark side of the rainbow. Arianne nodded, curls bouncing around her shoulders. A cobweb dangled from one of the nautical lanterns suspended from a hand-hewn beam above Olivia’s head. She stood on a chair, reached up, and brushed it away. Though both the building and the menu needed updates, the boat oars, fishing nets, and anchors adorning the whitewashed walls and the glass jars displaying colorful sea glass and shells gave the pastry shop a seaside, magazine-quality feel. Especially after she’d added thin crown molding to the display cases and then distressed them with white chalk paint. Silence reigned until a ping on the glass caught their attention. The predicted wintry mix had arrived. “Session?” The bill crinkled as Olivia slipped it in her apron pocket. How had Arianne found out her secret? “You.” Arianne gently squeezed Olivia’s elbow. “Don’t think I can’t see the heartache lurking behind your eyes. I’ve been there myself. There’s a reason you came to Stone Harbor that involves more than caring for your grandma.” After a quick hug, Arianne put up her hood and dashed for her car. So much for anonymity. There was truth to that women’s intuition thing. Olivia sucked in a deep breath. The cold air shocked her lungs. Indiana winters had been cold, but Maine felt like the tundra. She needed some heavier gear. After sweeping the small section of floor she’d missed earlier, she turned out the lights and pushed through the swinging doors to the kitchen. Gleaming stainless steel and the lingering smell of lemon cleaner made her smile. She was grateful for such a hard-working crew. And grateful they’d all left for the day. A quiet kitchen fed her creativity, revived her soul. She cocked her head. The building was too quiet. Had Grandma fallen asleep while organizing her new desk? Olivia rushed to the office, where she’d left her grandma reading earlier. Other than typical office stuff and a small loveseat, the room was empty. A young adult mystery novel lay bookmarked upside down on a cushion. The rear parking lot was void of cars and people but was quickly filling with sleet and snow. Where on earth had she gone? Panic set in. Olivia grabbed her purse and locked the doors behind her, the display case of treats the last thing she spied through the glass before icy drops pelted her head. If only her desserts could heal all the messes in her life. A cookie to regenerate her life’s purpose. A muffin to rebuild the declining bakery. An olive and sauerkraut pie to find a missing woman with Alzheimer’s.